BBL therapy is a safe and effective treatment for uneven skin texture and pigmentation, as well as redness and flushing. improve the texture of your skin and refinement of pores. BBL treatments work by channelling specific amounts of energy, which is light-based, into the skin to reach their target. Because our BBL is medical-grade we are able to select specific wavelengths from a broad range to treat your specific skin condition/s. We are also able to vary the amount of energy used and the delivery time, thus maximising your results and minimising your risk. A good result is usually achieved in 1-3 treatments. Most people usually commit to 2 initial treatments, after which time, with good suncare, one annual maintenance treatment is recommended. Annual treatments are best planned for the cooler months of the year. Based on previous experience, people who tend to sunburn rather than tan usually obtain good results on the first and subsequent treatments. On the other hand, those who tan more easily tend to have more variation in their results. It is advised that you have your skin checked by your regular skin specialist prior to having BBL treatments. BBL treatments may improve the look of ANY pigmented lesion. If the appearance of a rogue lesion is improved it may delay detection of pre-cancerous or cancerous diagnosis. Avoid tanning (sun or solarium induced) or self-tanning creams in the areas to be treated. Your treatment will be re-scheduled if you are tanned. If your skin is heavily sun-damaged, it is advisable to commence your treatments in the cooler months of the year. Once treatments are commenced should your skin colour change between treatments, you must inform your therapist as the treatment energy may need to be adjusted to avoid complications and to maximise your results. Please advise us if you are taking any medications, particularly Tetracycline (Minomycin) antibiotics or Roaccutane. You may not have any BBL treatment if you are taking Roacutane. Please ensure you have had at least six months break from Roaccutane. Please advise us if you are using any Vitamin A or Retinol creams. Treatments can be uncomfortable. You may consider taking 1g of Paracetamol 30 minutes prior to your appointment. Please avoid aspirin and ibuprofen (Nurofen). Most importantly, please minimise sun exposure. Please wear a quality zinc-based sunscreen daily and a wide-brimmed hat when outdoors, even when hanging out the washing! To maximize and maintain your results, a commitment to avoiding sun exposure is required. If blistering appears, and your skin is still warm, you may apply cool packs. If blisters form, take care not to rupture them. Please only use products as recommended by your therapist. Makeup can be applied, provided the skin is unbroken. Please use a light patting motion to apply. Please avoid aerobic exercise, use of saunas and hot tubs for 24-48 hours post treatment. If you have any questions or concerns please contact us without hesitation. BBL is an innovative light-based technology that sets new standards for treating skin conditions associated with aging, active life-styles and sun damage. BBL light energy allows your clinician to design treatments personalized for your skin and precisely treat age and sun spots, small facial veins, and many other skin defects. BBL phototherapy is noninvasive so you can receive comfortable and effective treatments to fit your schedule, even on a lunch break. 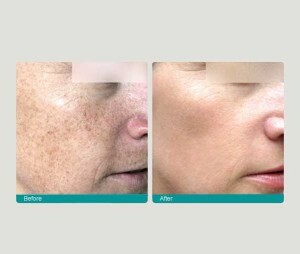 BBL deposits pulses of light energy that gently heats the upper layers of skin. Within the skin, the light energy is absorbed by targets, such as fine, broken vessels that cause redness and brown spots or pigmented lesions that are caused by an overproduction of melanin. This scientific and biological process destroys the target, eliminating it from the skin and restoring it to its natural beauty, blending its natural tones, making it more vibrant and youthful in appearance and touch. Any area of your body can be treated. The most popular treatments are on the face, neck, back of the hands, chest and shoulders. An active tan from the sun or tanning beds is not appropriate for treating with BBL. Tanned skin has a lot of pigment or melanin that may also absorb the BBL light energy. It is recommended that a person does not have sun exposure in the area to be treated for a period of 3 weeks prior to treatment with BBL. Self tanners must be faded from the skin for at least a week to 10 days prior to treatment. Discuss with your clinician the possibility of tanning during your series so that a safe regimen can be created. The number of treatments needed varies from patient to patient and your clinician will personalize a treatment plan based on your skin defects and the level of improvement you desire. Your clinician may also combine your treatment with other popular aesthetic procedures to further enhance the outcome. Your eyes will be protected with safety shields or glasses. You may briefly feel a warm or “rubber band snap” sensation as the light is absorbed by the targeted areas. Your procedure may take a few minutes to a half an hour depending on the size of the area to be treated and the type of procedure performed. Your clinician will discuss all of your options with you. You may experience some redness that should resolve within a few hours. Pigmented lesions will darken and gradually flake off and fade over the next 7-10 days. Often your treated skin will feel smoother, fine lines and pores begin to be less noticeable, and sunspots or uneven pigmentation will fade. Results depend on your skin’s condition, the number of treatments, and the area treated. Your clinician will provide you with complete information about the post treatment care and results. It is important to follow your clinician’s instructions. You may be given some skin care products and instructions on how to use them. If you must go outdoors, it is recommended that you cover your treated skin and use sun block of SPF 30. Will insurance cover this procedure? Phototherapy treatments, like other cosmetic procedures, are not usually covered by your insurance company. If you have any questions, it is best to talk with your provider.